Microsurgery has been developed from groin flap and other conventional flaps to perforator flaps, which are less invasive and more convenient than conventional ones. Microsurgeons are now acquiring the technique of supermicrosurgery, which is defined as an anastomosis of smaller vessels that have a diameter of less than 0.5 mm. However, there are some difficulties to perform supermicrosurgery, in terms of mechanical, technical and environmental points. The aim of this work is to evaluate how telemicroscopes would contribute for supermicrosurgery. 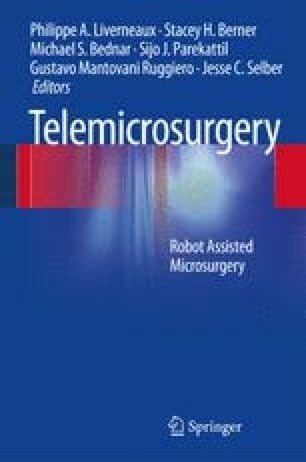 When telesupermicrosurgery is performed, the difficulties of supermicrosurgery could be overcome. Not only tremor can be cancelled and smaller instrument can provide finer performance, but multi-joint movement and view direction controlling can also make easier and faster anastomosis. Multiple views of different magnifications and different directions can be also helpful. Telesupermicrosurgery is sure to evoke some breakthroughs to supermicrosurgery and make it easier to perform supermicrosurgical operations.